The PIXMA PRO-100 is built for creative pursuits at home or in the office. Vibrant colour. Exceptional detail. Remarkable reliability. Eight ChromaLife Dye inks with three monochrome shades provide the colour depth to capture even the smallest of details of your photos, computer drawings and illustrations. With three times more area than an 8x10, gallery-sized 13x19 prints make a bigger impression when sharing your moments or used as a tool for visual collaboration. Employing four times more nozzles than its nearest competitor, the reliable PIXMA PRO-100 print head clogs less and requires fewer cleanings - saving you money, time and hassle. Print from any application with smart Windows or Mac printer drivers. Output wirelessly from the convenience of your home or studio. The PIXMA PRO-10 empowers working artists and professional photographers to push the limits of their creative expression. True colours. Long-lasting prints. Extensive media choices. Ten individual colours deliver the dynamic range needed to express subtle details found in all genres of the photographic and creative arts. Canon LUCIA pigment inks invite you to test your creativity on over 200 compatible materials from leading fine art paper manufacturers. Canon LUCIA pigment inks are archive-ready and resist fading for over 100 years. Employing five times more nozzles than its nearest competitor, the reliable PIXMA PRO-10 print head clogs less and requires fewer cleanings - saving you money, time and hassle. The PIXMA PRO-1 is the precision printer that top photographers rely on to reproduce their finest work. 12 individual colours make greyscale and colour imagery take on new life with unmatched dynamic range and delicate, natural tonal gradations from highlights to shadows. A category-best, five black inks enable the PIXMA PRO-1 to create stunning B&W prints that approach the expressiveness of silver halide photographic process. Employing eight times more nozzles than its nearest competitor, the reliable PIXMA PRO-1 print head clogs less and requires fewer cleanings - saving you money, time and hassle. * The PRO-1 ships with a full set of cartridges. When installing the ink tanks in the PRO-1 for the first time, part of the ink from the first set of cartridges is used to fill the ink lines. The number of sheets that can be printed with the first tanks is less than succeeding cartridges. The PIXMA PRO-100 has received a Professional Photographer 2013 Hot One Award in the Inkjet Printer between $500 and $1,000 category. For the 9th Year in a row, Canon U.S.A. is proud to have received 2012 Readers' Choice Award for Service & Reliability from PCMag.com for Printers. A trademark of Ziff Davis, Inc. Used under license. Reprinted with permission. Copyright 2012 Ziff Davis, Inc. All rights reserved. Awarded 2013 Best Expert Photo Printer by TIPA. The PIXMA PRO-10 has received a Professional Photographer 2013 Hot One Award in the Inkjet Printer between $500 and $1,000 category. The PIXMA PRO-1 received the 2012 DP Review Gold Award. Canon's PIXMA PRO-1 wins PDN's 2012 Gear of the Year Award. ith a PIXMA PRO printer, it’s easier than you think to print and hang your photographs especially with some great tips from design expert Leigh-Ann Perrault. Watch as Leigh-Ann helps create a very special anniversary surprise. Here’s a great way to be surrounded by your most cherished moments. After all, your best photos deserve to be displayed in your home, not just on your screen. Follow these simple steps to create a gallery wall in a short amount of time. And the best part? It’s easy to update your wall with new pictures, thanks to the PIXMA PRO 13x19" printer. Choose your favourite photo to act as an anchor piece that draws attention to your wall. Print your anchor photo on 13” x 9” photo paper – it will be your largest print. No need to get this professionally done – it’s quick and easy with your Canon PIXMA PRO printer. Print the rest of your photos to fit in your frames. Create a perimeter on the wall using low tack painters tape to identify the area that you want to fill with a collage. This will visually help you define a boundary and also act as a guide so you ensure you select enough photos and frames to completely fill the space. Using craft paper, trace each of the photo frames and then cut them out to create an easy to place template. Using templates makes it much easier to lay out and change your photo arrangement before you commit with hammer and nails. Forget the hassle of a measuring tape to determine where to place your picture hangers. Instead, line up your craft paper template on the back of the corresponding frame, and puncture a small hole with a pen where the hook is. This way, all you need to do once the template is taped to the wall is ensure it's straight with a level, and then you can start hammering. Puncture holes with a pen in each template where the nail will go. This will make it so much easier to hang your photos on the wall. Find the centre of your workspace and place your anchor template there. Working with the largest pieces first, arrange the templates around the anchor until you are happy with how the wall looks. Once you’ve decided on your arrangement, hammer the nails through the marks on your template. Rip the templates off the wall and start hanging your masterpieces. Refresh your wall as often as you like with photos printed on your PIXMA PRO printer. As a colour and design aficionado, lifestyle expert and DIY doyenne, Leigh-Ann Allaire Perrault has spent years crafting a unique philosophy for design that fuses ingenuity, whimsy and quality workmanship all on a “frugalista” budget. She believes that great design is not about how much money you spend, but rather how creative you can be. 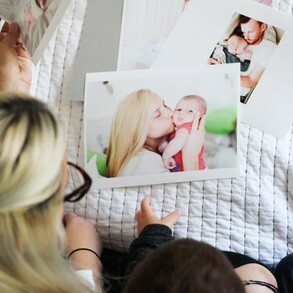 "Getting around to printing our photos has been a challenge, so having the convenience of printing them in our home is a total game changer, especially with the amazing quality they are in." "We decided to use the Canon PIXMA Pro-100 photo printer to print all our favourite photos that we’ve taken. I loved being able to print my photos at home in whatever size I needed or wanted." "This printer can actually churn out prints that are 13" x 19" which is impressive to say the least."